Admission to the program will be based on merit in the joint entrance exam and choice of institutes exercised by the candidate. Candidates can check all details of M.Sc. Hospitality Administration 2019 from this page given below. The M.Sc. Program launched by NCHMCT in collaboration with IGNOU has specific focus on the services sector as against majority of MBA Programs which concentrate on merchandise and manufacturing businesses. The two-year or four-semester MSc Program in Hotel Administration offered by the National Council for Hotel Management focuses on Business & Management Studies specific to Hospitality. With specialization in two broad areas of Management that include HRM and Sales and Marketing Management, students can join industries as functional managers. The Program is delivered through four premier Central affiliated IHMs of NCHMCT viz., Pusa, Chennai, Bangalore, Lucknow and Kolkata and the NCHM-IH at Noida Campus. Candidate should be B.Sc. 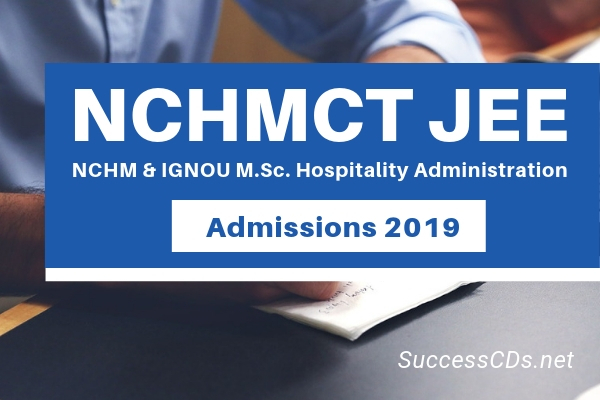 Degree in Hospitality and Hotel Administration from NCHMCT-IGNOU; OR Bachelor’s Degree in Hotel Management from a recognized University and the Institute is approved by AICTE. Candidates appearing in the final semester/final year exam (but passed all the papers in all earlier semesters/years) of the above said Degrees and able to submit their complete Bachelor’s Degree latest by 31st October 2019 can also apply. After allotment of seats through direct admission process, if any, under the above mentioned category (Direction Admission) the left out seats will be filled through candidates appeared in JEE. However, the question not attended will fetch zero marks. Envelope containing application should be super-scribed as application for admission to M.Sc. HA Program. Applications received after 30th April 2019 will not be entertained. Applications received without copies of required certificates in support of qualification and experience will summarily be rejected. The M.Sc. Degree will be awarded to scholars who successfully pass the NCHMCT and IGNOU components respectively with 50% marks. The Degree shall be awarded by IGNOU duly acknowledging credits of NCHMCT components.